After years in beta, VMware has announced general availability of its software-defined storage Virtual SAN (VSAN) product, which will allow customers to build SAN-like shared storage from existing server-attached hard drive capacity. The product will not compete with high-end storage arrays and will not allow users to pool storage in existing purpose-built arrays, but will allow them to create a single pool of storage from drives in up to 32 servers. VMware said its most likely use cases will be virtual desktop infrastructure (VDI), tier 2 and tier 3 production operations – for example, non-tier 1 apps, test and development, file and print – and as secondary storage in a disaster recovery environment. VSAN runs in the hypervisor on an x86 server as a virtual appliance and can create pools of storage with up to two million IOPS (input/output operations per second) on a 32-node cluster. Multi-level cell (MLC) flash is required for caching, while other disks can comprise serial-attached SCSI (SAS), nearline-SAS or SATA. It integrates with the vSphere environment and does away with the use of logical unit numbers (LUNs) as is usual in SAN arrays. 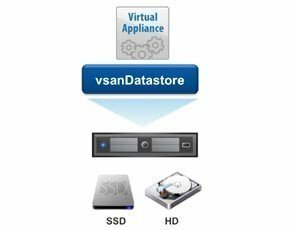 Instead, a VSAN datastore can provide differentiated service levels based on individual virtual machine policies. Integration with vSphere means it can make use of features that include Storage vMotion, Distributed Resource Scheduler (DRS), VSphere High Availability, Snapshots, vSphere Data Protection, Linked Clones and vSphere’s cloud operations management features. VSAN is one of a number of software-defined storage products currently emerging in the market that include storage virtualisation functionality, such as the ability to create pools of storage from disparate disk resources. These include EMC’s ViPR, which also includes integration big data analytics functionality, NetApp’s recently announced FlexArray software, and longer established storage virtualisation software from the likes of DataCore and Nexenta. VSAN differs from the above products in that it is only capable of aggregating direct-attached disk from servers and not purpose-built storage arrays. Rory Choudhuri, senior product marketing manager with VMware, said this is because it is “intended to complement existing storage solutions and use storage in the host that is being under-utilised. It offers the performance and features of mid-range storage at the TCO [total cost of ownership] of a low-end array”. VMware will sell VSAN as a pre-configured hardware appliance or as a software-only product for DIY implementation. There will be 13 pre-configured options based on servers from Cisco, IBM, Dell, Fujitsu and with the working title “Ready Blocks”. DIY deployment can use any x86 server plus MLC flash drives, SAS, NL-SAS, SATA and 6Gbps HBAs. VSAN forms part of VMware’s software-defined datacentre strategy. In this, the company has a layered idea of the datacentre architecture. At the top is the “control plane” where virtual machine requirements are defined as automated policy elements, matching, for example, capacity, performance, latency, RPOs, RTOs, etc, to individual virtual machines (VMs). The idea is that this removes the manual process of provisioning and deprovisioning in the datacentre. VSAN fits as part of the underlying storage to this, as a “hypervisor-converged storage pool” alongside SAN, NAS and object-based storage.